Bloody Sunday occurred in Dublin on 21 November 1920 and would mark a turning point for the War of Independence leaving 31 people dead in a single day. This would become important event in the military struggle between the IRA and the British armed forces in Ireland at the time. British intelligence had a large network of spies located in Dublin including 18 high-ranking spies that were nicknamed the Cairo Gang. The nickname was given after they used the Cairo Café in Grafton Street as a meeting point but also for their operations in Egypt and Palestine during the First World War. 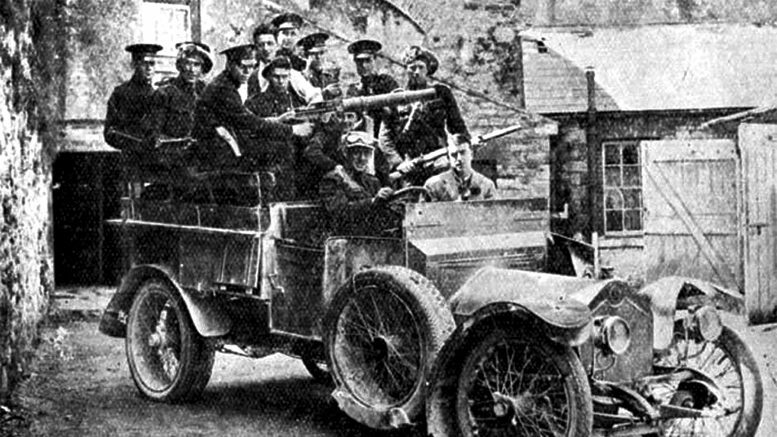 The IRA had already created a hit squad in 1919 who was tasked with locating and assassinating British intelligence officers. With the Cairo Gang putting IRA operations in danger the IRA Chief of Intelligence, Michael Collins, gave the order to have them assassinated in November 1920. The day before Bloody Sunday the IRA squads were briefed on their targets which included 20 agents in 8 different locations and on the morning of November 21st the IRA set out across Dublin to assassinate their targets. In total, 15 of the targets were killed with many others not being at known locations. Although a high number of the targets were not caught the events that morning had the majority of them running scared with many feeling Dublin Castle. There is a football match between a TIPPERARY team and a DUBLIN team taking place at CROKE PARK at 1445 hours this afternoon. You will surround the ground and picquet all exits, No picquet should be less than 1 Officer and 15 men. About a quarter of an hour before the match is over a Special Intelligence Officer will warn by megaphone all people present at the match that they will only leave the ground by the exits. Anybody attempting to get away elsewhere will be shot.” Every man present was to be stopped and searched. Although scheduled to start at 2:45pm the kick off was 30 minutes late. Numbers in attendance were unknown and had varied between 5000 – 15000. The security forces began surrounding the stadium grounds and at 3:25pm the first shots rang out, within a few minutes 14 people lay dead or were dying. Many others were injured due to the stampede of spectators fleeing in panic. Controversy has always surrounded who was the blame for the killings at Croke Park. Many historians believe the killings were in revenge for the earlier killings of the British intelligence officers with others blaming a gun man opening fire on security forces from within Croke Park. After the massacre two military courts found that “the fire of the RIC was carried out without orders and exceeded the demands of the situation” and Major-General Boyd, the officer commanding Dublin District, added “the firing on the crowd was carried out without orders, was indiscriminate, and unjustifiable, with the exception of any shooting which took place inside the enclosure”. This information was suppressed by the British Government until the year 2000. The news of the murders at Croke Park made international headlines but in Britain the killings of the British agents during that morning had received more attention. When the killings of Croke Park were brought up at Westminster in London by Joseph Devlin he was shouted down and the sitting was suspended. Public opinion in Ireland of the Auxiliaries and the Black and Tans quickly turned and gave more support for a republican government under Éamon de Valera. Today Bloody Sunday is still remembered and in memory of Michael Hogan, the player killed during the match, the Gaelic Athletic Association named one of the stands the Hogan Stand. T. Ryle Dwyer, The Squad and the intelligence operations of Michael Collins, Dublin, 2005.